Professionals in the field of physical medicine rely on the study of human form and posture to determine deviations from normal and apply appropriate corrections to the underlying structure. It is commonly accepted that departures from correct form, posture, or structure, through either acute trauma or insidious degradation, affect function. Muscles exert their pull and force more efficiently across joints, and the human body is better able to counteract the effects of gravity and the ergonomics of our sedentary lifestyles, when ideal postural balances are maintained. This concept is illustrated by studies of the cervical spine, which have demonstrated that changes in joint position and moment arms affect the moment generating capacities of muscles,1 and that posture has an effect of motion coupling.2 There is a conservation of energy and an efficiency of function essential to the biomechanical workings of the human body. When these concepts are considered within the scope of current popular foot orthosis intervention strategies, the question arises as to why they have not been applied to the foot to any significant degree. Although practitioners may consider these concepts in their clinical evaluation, it seems that these ideas have lost traction when it comes to foot orthosis design and correctional modeling. In many common models, emphasis is less on correcting foot position or posture that may have deteriorated and more about shifting tissue stresses and forces. Although shifting tissue stresses may provide pain relief, it may be too narrowly focused to provide the most complete preventive solution to the problem. To summarize, if these static measurements are unreliable and unrelated to the function of the patient’s foot in motion, then skepticism on the part of the clinician regarding these types of foot posture measurements is warranted. However, abandoning the concept of foot posture altogether because the rearfoot measurements don’t correlate does not help with the great incongruity that exists: We generally accept the concept of a proper architecture to the rest of the human body, so why should this not apply to the foot? In contrast to the clinical murkiness of the measurements discussed above, we do know that there are statistical differences in biomechanical function between the planus and rectus foot.13 It is thought that changes in foot structure affect dynamic function,14 and foot morphology has been implicated in a variety of lower extremity overuse injuries.15,16 A pronated foot posture is thought to be a factor in various pathologic conditions of the foot; for example, excessive foot pronation has been cited as a cause of limited dorsiflexion at the first metatarsophalangeal joint during gait.17,18 Munteanu et al also postulated that people with pronated feet are more likely to exhibit limitation of dorsiflexion at the first MPJ during gait and found that orthoses focusing on the forefoot to rearfoot relationship (Blake-style inverted) did not significantly change the first MPJ range of motion.19 Could this be due to the focus of this type of intervention on the forefoot to rearfoot relationship, rather than on restoring proper orientation or posture to the entire foot? Since the days of Merton Root, the correction of perceived imbalances in the forefoot to rearfoot relationship has been the goal of orthotic intervention. It is clear the relationship of these measurements to the improvement of the human gait cycle is questionable. Previously, the midfoot was modeled as one rigid segment based on the assumption that negligible motion took place within the midfoot.20 We now know that movements including walking and slow running involve considerable motion between midfoot bones.21-24 It is logical to consider this midfoot motion in any attempt to control the foot with an intervention such as a foot orthosis. Perhaps there is evidence that returning the focus to the midfoot, medial longitudinal arch, and plantar vault could yield measurements that relate more directly to the dynamic gait cycle and result in improved clinical outcomes. The foot line test (FLT), which is a measure of the medial prominence of the navicular bone in a mediolateral direction, was developed to investigate the relationship between foot morphology and injury development. The measurement of medial/lateral movement of the medial prominence of the navicular is primarily a frontal plane measurement, so although the FLT has been shown to be a reliable measure,28 future work is needed to determine if this measure correlates with dynamic function. 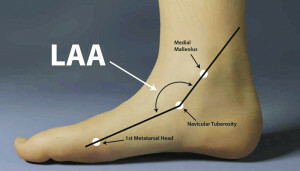 The longitudinal arch angle (LAA) is defined as the angle formed by two vectors: one passing through the midpoint of the medial malleolus to the navicular tuberosity and the other passing through the midpoint of the medial aspect of the first metatarsal head to the navicular tuberosity (Figure 1). What is interesting about the work done with these angles is that it is starting to reveal measurements that show good interrater reliability,29 are prognostic of dynamic foot posture during walking and running, and may have some value in predicting the risk of lower extremity injuries.30,31 This is good news for the clinician who looks to the published research to confirm and validate his or her clinical measures. It seems plausible that the closer the measurements get to a measure of the medial longitudinal arch and plantar vault of the foot, the more applicable they are to the dynamic gait cycle. 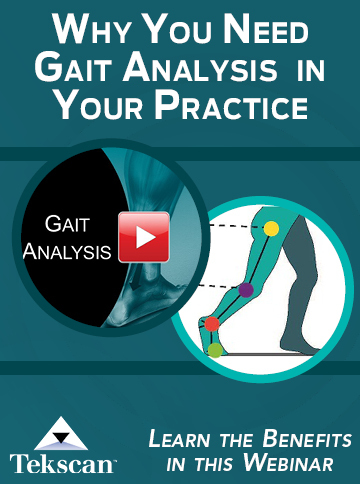 This correlates with the knowledge that significantly more sagittal plane motion is required during each step of the gait cycle than in the transverse and frontal planes.32 Put quite simply, there is an accepted clinical relevance to the arch of the foot and its perceived position—either low or high—and it may very well be that the closer a measurement gets to describing this position, the more dynamically relevant it is. Therefore, a distinction is needed between those foot type classifications that focus on frontal plane measurements and foot posture that is evaluated with respect to the medial longitudinal arch, or a 3D posture. Looking at some of the more recent measurements that have focused more on the medial longitudinal arch reveals progress toward defining more reliable, clinically relevant measures. To date, much of the study of foot posture has included discussions of frontal plane orientations such as calcaneal inversion. The aforementioned evidence suggests that more clinically relevant measures may be found in the midfoot and medial longitudinal arch. Continuing along this logic path, it is possible that accounting for the entire plantar vault may give us a better understanding of which changes in foot posture are relevant to our clinical decisions. In an ideal scenario, a measurement would be accurate, reliable, and backed by clinical outcomes. It would describe the entire foot and, perhaps most important, predict the dynamic function of the foot. So what is the ideal foot posture if it is unrelated to subtalar neutral? Several theories have emerged over the past decade or two that provide possible alternatives to the subtalar neutral theory originally posited by Root. These include (but are not limited to) the tissue stress theory, the preferred movement pathway theory, the sagittal plane facilitation theory, the subtalar joint axis location/rotational equilibrium theory, and the MASS position theory.33-37 A detailed analysis of each theory is beyond the scope of this article; the remainder of this discussion will involve the MASS (maximum arch subtalar supination) position theory, which focuses its orthotic intervention on direct support to the medial longitudinal arch and plantar vault, as it relates to a defined and corrected foot posture. 4) no limitation of first MPJ dorsiflexion. Figure 2. Above, the MASS orthosis design directly fills the full contour of the corrected MLA position, supporting the foot in the corrected position. Below, relative arch heights of neutral position (red) versus MASS position. This posture is captured using a gait-referenced sequence with semi-weight-bearing loading. The casting method is the same for all feet, though each foot yields a unique 3D shape due to unique anatomical variations and flexibility differences. It is based on the concept that if there is a corrected foot posture that is to be achieved, it needs to be emulated and induced directly by the intervention, in this case a foot orthosis. This direct intervention takes the form of a full-contact, weight-calibrated orthosis (Figure 2). 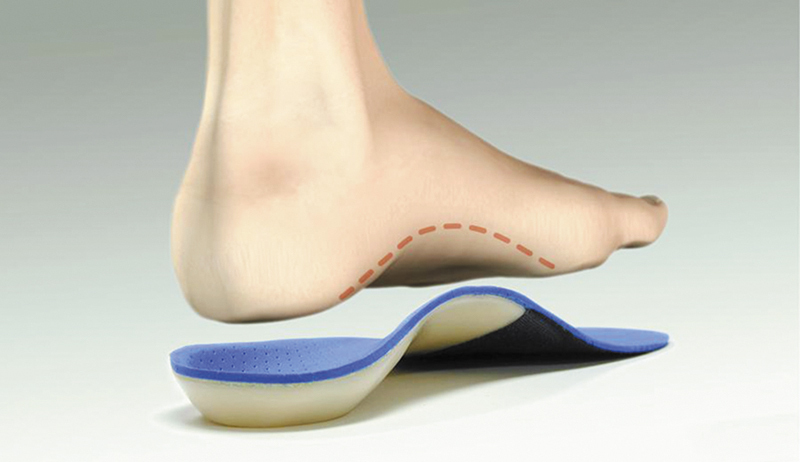 It has been shown that orthoses with higher medial arch profiles provide advantages, including significantly reduced tension on the plantar aponeurosis compared to their lower-arched subtalar neutral functional orthosis counterparts, and it is further theorized that control of the medial longitudinal arch is facilitated by support to the apical bony structures of the arch.38 Hence it seems plausible that a correction strategy such as MASS position, aimed at directly supporting the arch in a supinated posture (with no cast correction), should provide some of these benefits. Although this has yet to be directly explored, there is some evidence of improved clinical outcomes with orthotics based in the MASS position. 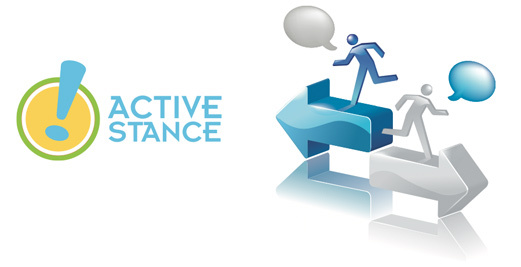 The full contact quality itself is not one that comes with inherent contraindications; in the attempt to provide a corrective force with a foot orthotic device, contact with the foot is a requirement. Certainly there are situations where rigidity or flexibility become issues (such as with recent surgical fixations). However, the casting technique will not allow an overcorrection past the anatomical limits, and in these cases the orthotic may facilitate the dispersal of force per unit area. MASS position theory requires the flexibility of the orthotic shell to be unique to the requirements of each foot, allowing more or less flexibility on an individual level. Patient-specific thicknesses of high-molecular-weight plastic are determined based on known clinical variables to deliver the required correctional force, while at the same time being tolerable. These variables can include patient body weight, foot flexibility, arch morphology characteristics, and activity levels. Two variables that have been correlated with supination resistance of the rearfoot are body weight and medial deviation of the subtalar joint axis.42 In other words, a heavier person with a more medially deviated subtalar joint axis requires a greater amount of force from an orthotic to balance the pronatory forces. The converse would be true of a lighter person. An orthotic device must account for all of these variables to apply an effective corrective force to the bony architecture of the foot. Foot posture measurements taken in the MASS position may prove particularly applicable to clinical decision making with regard to orthosis manufacture, as they can be compared volumetrically to a pronated foot posture or relaxed calcaneal stance position. Knowing that there is an optimal foot posture that may be different for each individual, but based on the same reference points, logic follows that there is a spectrum of function (or dysfunction) and a zone of optimal control. Future writings and investigations will focus on the zones of postural control and their application to treatment with foot orthoses. Stu Currie, DC, directs in-house research and development and coordinates outside university investigations for Sole Supports in Lyles, TN. Don Bursch, PT, OCS, is the president of the company and creates the company’s visual educational training material. Ed Glaser, DPM, is the owner and founder of the company and originator of the MASS theory. 1. Vasavada AN, Li S, Delp SL. Influence of muscle morphometry and moment arms on the moment-generating capacity of human neck muscles. Spine 1998;23(4):412-422. 2. Panjabi MM, Oda T, Crisco JJ III, et al. Posture affects motion coupling patterns of the upper cervical spine. J Orthop Res 1993;11(4):525-536. 3. Pierrynowski MR, Smith SB. Rear foot inversion/eversion during gait relative to the subtalar joint neutral position. Foot Ankle Int 1996;17(7):406-412. 4. McPoil T, Cornwall MW. Relationship between neutral subtalar joint position and pattern of rearfoot motion during walking. Foot Ankle Int 1994;15(3):141-145. 5. Davis IS, Zifchock RA, Deleo AT. A comparison of rearfoot motion control and comfort between custom and semicustom foot orthotic devices. J Am Podiatr Med Assoc 2008;98(5):394-403. 6. Ferber R, Davis IM, Williams DS, III. Effect of foot orthotics on rearfoot and tibia joint coupling patterns and variability. J Biomech 2005;38(3):477-483. 7. Root ML, Orien WP, Weed JN. Biomechanical examination of the foot. Los Angeles: Clinical Biomechanics Corp; 1971. 8. Payne CB. 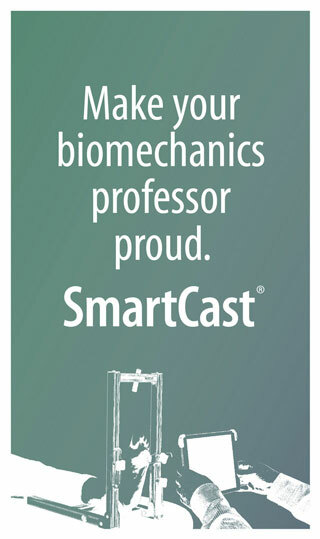 The past, present, and future of podiatric biomechanics. J Am Podiatr Med Assoc 1998;88(2):53-63. 9. Somers DL, Hanson JA, Kedzierski CM, et al. The influence of experience on the reliability of goniometric and visual measurement of forefoot position. J Orthop Sports Phys Ther 1997;25(3):192-202. 10. Chuter V, Payne C, Miller K. Variability of neutral-position casting of the foot. J Am Podiatr Med Assoc 2003;93(1):1-5. 11. Van Gheluwe B, Kirby KA, Roosen P, Phillips RD. Reliability and accuracy of biomechanical measurements of the lower extremities. J Am Podiatr Med Assoc 2002;92(6):317-326. 12. McPoil TG, Cornwall MW. The relationship between static lower extremity measurements and rearfoot motion during walking. J Orthop Sports Phys Ther 1996;24(5):309-314. 13. Song J, Hillstrom HJ, Secord D, Levitt J. Foot type biomechanics. comparison of planus and rectus foot types. J Am Podiatr Med Assoc 1996;86(1):16-23. 14. Cavanagh PR, Morag E, Boulton AJ, et al. The relationship of static foot structure to dynamic foot function. J Biomech 1997;30(3):243-250. 15. Krivickas LS. Anatomical factors associated with overuse sports injuries. Sports Med 1997;24(2):132-146. 16. Yates B, White S. The incidence and risk factors in the development of medial tibial stress syndrome among naval recruits. Am J Sports Med 2004;32(3):772-780. 17. Roukis TS, Scherer PR, Anderson CF. Position of the first ray and motion of the first metatarsophalangeal joint. J Am Podiatr Med Assoc 1996;86(11):538-546. 18. Harradine PD, Bevan LS. The effect of rearfoot eversion on maximal hallux dorsiflexion. A preliminary study. J Am Podiatr Med Assoc 2000;90(8):390-393. 19. Munteanu SE, Bassed AD. Effect of foot posture and inverted foot orthoses on hallux dorsiflexion. J Am Podiatr Med Assoc 2006;96(1):32-37. 20. Leardini A, Benedetti MG, Berti L, et al. Rear-foot, mid-foot and fore-foot motion during the stance phase of gait. Gait Posture 2007;25(3):453-462. 21. Benink RJ. The constraint-mechanism of the human tarsus. A roentgenological experimental study. Acta Orthop Scand 1985;56(215 Suppl):49-68. 22. Nester C, Jones RK, Liu A et al. Foot kinematics during walking measured using bone and surface mounted markers. J Biomech 2007;40(15):3412-3423. 23. Arndt A, Wolf P, Liu A et al. Intrinsic foot kinematics measured in vivo during the stance phase of slow running. J Biomech 2007;40(12):2672-2678. 24. Phillips RD, Law EA, Ward ED. Functional motion of the medial column joints of the foot during propulsion. J Am Podiatr Med Assoc 1996;86(10):474-486. 25. Redmond AC, Crosbie J, Ouvrier RA. Development and validation of a novel rating system for scoring standing foot posture: the Foot Posture Index. Clin Biomech (Bristol, Avon) 2006;21(1):89-98. 26. Cornwall MW, McPoil TG, Lebec M, et al. Reliability of the modified Foot Posture Index. J Am Podiatr Med Assoc 2008;98(1):7-13. 27. Neilsen R, Rathleff M, Kersting U, et al. The predictive value of the foot posture index on dynamic function. 2008. 28. Brushoj C, Langberg H, Larsen K, et al. Reliability and normative values of the foot line test: a technique to assess foot posture. J Orthop Sports Phys Ther 2007;37(11):703-707. 29.Jonson SR, Gross MT. Intraexaminer reliability, interexaminer reliability, and mean values for nine lower extremity skeletal measures in healthy naval midshipmen. J Orthop Sports Phys Ther 1997;25(4):253-263. 30. McPoil TG, Cornwall MW. Prediction of dynamic foot posture during running using the longitudinal arch angle. J Am Podiatr Med Assoc 2007;97(2):102-107. 31. McPoil TG, Cornwall MW. Use of the longitudinal arch angle to predict dynamic foot posture in walking. J Am Podiatr Med Assoc 2005;95(2):114-120. 32. Dananberg HJ. Sagittal plane biomechanics. J Am Podiatr Med Assoc 2000;90(1):47-50. 33. McPoil TG, Hunt GC. Evaluation and management of foot and ankle disorders: present problems and future directions. J Orthop Sports Phys Ther 1995;21(6):381-388. 34. Nigg BM. The role of impact forces and foot pronation: a new paradigm. Clin J Sport Med 2001 January;11(1):2-9. 35. Payne C, Dananberg H. Sagittal plane facilitation of the foot. Aust J Pod Med 1997;31:7-11. 36. Kirby KA. Subtalar joint axis location and rotational equilibrium theory of foot function. J Am Podiatr Med Assoc 2001;91(9):465-487. 37. Glaser E.S., Bursch D, Currie SJ. Theory, practice combine for custom orthoses. Biomechanics 2006;13(9):33-43. 38. Kogler GF, Solomonidis SE, Paul JP. Biomechanics of longitudinal arch support mechanisms in foot orthoses and their effect on plantar aponeurosis strain. Clin Biomech (Bristol , Avon ) 1996;11(5):243-252. 39. Trotter LC, Pierrynowski MR. The short-term effectiveness of full-contact custom-made foot orthoses and prefabricated shoe inserts on lower-extremity musculoskeletal pain: a randomized clinical trial. J Am Podiatr Med Assoc 2008;98(5):357-363. 40. Trotter LC, Pierrynowski MR. Changes in Gait Economy Between Full-Contact Custom-made Foot Orthoses and Prefabricated Inserts in Patients with Musculoskeletal Pain: A Randomized Clinical Trial. J Am Podiatr Med Assoc 2008;98(6):429-435. 41. Trotter LC, Pierrynowski MR. Ability of foot care professionals to cast feet using the nonweightbearing plaster and the gait-referenced foam casting techniques. J Am Podiatr Med Assoc 2008;98(1):14-18. 42. Payne C, Munteanu S, Miller K. Position of the subtalar joint axis and resistance of the rearfoot to supination. J Am Podiatr Med Assoc 2003;93(2):131-135. This functional range is about as far from the MASS position as it is possible to get, yet is equally obviously functioning extremely well. If MASS is optimal, why is this apex athlete functioning so well, so far from it. Would he function better with a MASS orthotic? Secondly, and more profoundly, the MASS model takes NO consideration of the actual nature of the pathology. Would anyone seriously suggest that the maximally supinated postion is optimal for a foot with a strain in one of the lateral structures? An inversion sprain for example, is an inverted postion (MASS) the optimal postion for treatment of an inversion sprain? It is worth noting that the two studies quoted for outcomes compared these insoles not to shaped pre fabricated orthoses, but to flat 3mm pieces of poron. Scarcly robust evidence that this position is superior to any other! The answer, for me, is simple. There is NO single ideal foot posture for every individual with any pathology, in every circumstance. Sadly, life is rarely that simple. The concept of an ideal position for the foot is as illogical as the concept of an ideal position of the knee, or the hip. The most favourable position for an orthotic is subject specific, injury dependant and will depend on activity and footwear. 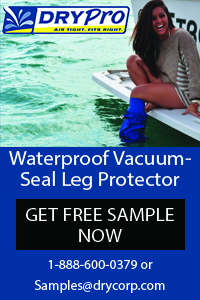 The foot defies such attempts to simplify its function, as much as it may be profitable and marketable to do so!.